Over recent days, team members at Everything Dinosaur have been reviewing the breadth and scope of the articles posted on this blog in the last twelve months. The number of Sauropodomorpha themed articles (Sauropods and their ancestors), has been commented upon. There have certainly been some amazing early, long-necked dinosaur discoveries, but we have also had a lot of exciting fossil discoveries concerning the Plantae Kingdom to write about too. In 2019, we have reported on research that suggests the very first land plants evolved earlier than previously thought. We have also written about new compelling evidence that suggests that flowering plants (Angiosperms), were present during the Middle Jurassic. A beautifully preserved seed fern frond in mudstone from the Jordan (Upper Permian). It seems fitting that our last post for 2019, once again looks at some remarkable plant fossil discoveries. All the fossils pre-date the End-Permian extinction event that wiped out around 95% of all the life on our planet and the fossils prove that all three plant groups evolved millions of years earlier than previously thought. For example, the now extinct Bennettitales were thought to have evolved sometime in the Triassic. These fossils confirm that their evolution took place much earlier and that all three types of plant evolved before and persisted through the greatest mass extinction event known in Phanerozoic Eon. Fossilised twigs representing the Podocarpaceae, commonly referred to as southern conifers, as the vast majority of extant species are found in the southern hemisphere, have been found. These fossils represent the oldest record of any living conifer family. In collaboration with colleagues from the Smithsonian Institute (USA) and scientists from the University of Jordan, the team also discovered the preserved, carbonised leaves and reproductive organs of Corystospermaceae, a group of seed ferns that went extinct some 150 million years ago, as well as remains of Bennettitales, a peculiar lineage of extinct seed plants with flower-like reproductive organs. Exploring Upper Permian fossil deposits for evidence of an ancient, lowland plant community. Evidence for the unexpectedly early occurrence of Corystospermaceae in the Permian of Jordan was first published about ten years ago by a research team led by Prof Dr Hans Kerp. Since then, researchers have uncovered not only the well-preserved leaves but also the characteristic reproductive organs of this group of plants. Like Bennettitales and Podocarpaceae, these plants were believed to have evolved millions of years later during the Early Mesozoic. The researchers noted that the plant fossils at the site represent a diverse and very mixed assemblage of plant types. The sedimentary deposits were laid down in an equatorial coastal environment with a distinct dry season – an ecosystem that rarely preserves delicate plant fossils. The scientists conclude that, early evolutionary innovations can occur in drought-prone tropical habitats which rarely offer the conditions needed for fossil preservation. Once the fossil material had been collected by the field team, a variety of methods were employed in the preparation laboratory to help identify the plant types the fossils represented. Powerful acids were used on some specimens to prepare plant cuticles for detailed microscopic analysis. It can be very difficult to distinguish Pteridosperms from ferns based on foliage alone. Similarly, the fossil leaves of cycads are very difficult to tell apart from those of true Bennettitales. Identification is usually confirmed by examining microscopic details preserved in cells and on the cell wall of the cuticle, hence the need to use a variety of delicate techniques to reveal fine details. A fragment of a seed fern frond after acid preparation. The plant fossils have been dated to approximately 255 million years ago (Lopingian Epoch of the Late Permian), so this ecosystem existed just a few million years prior to the “Great Permian Dying”, a mass extinction event that devasted both marine and terrestrial ecosystems. The unexpected discovery of these three main groups of plants prior to this extinction event, not only pushes back the origins of these plant types in time, but also proves that all three groups survived the End-Permian extinction event. Some of these lineages appear to span the mass extinction event, which suggests that the communities they supported may have been more stable than expected over this period of dramatic transition and change. Thus, early evolutionary innovations can occur in drought-prone tropical habitats, which rarely offer the conditions needed for fossil preservation. Seasonally dry tropical environments could be described as “cradles of evolution”. The scientific paper: “A Hidden Cradle of Plant Evolution in Permian Tropical Lowlands” by Patrick Blomenkemper, Hans Kerp, Abdalla Abu Hamad, William A. DiMichele and Benjamin Bomfleur published in the journal Science. Everything Dinosaur acknowledges the assistance of a press release from the University of Münster in the compilation of this article. Time to stick our collective necks out to see if we can predict the sort of news stories that we are going to feature on this blog next year (2019). We took a break from making predictions in 2018, after all, just like fossil collecting, attempting to foresee some of the scientific discoveries that will be covered in the next twelve months can be a bit of a hit and miss affair to say the least. However, with our trusty geological hammers tucked into our rucksack next to our crystal ball, here are our suggestions as to the fossil finds and palaeontology themed stories that 2019 will bring. After the dearth of new horned dinosaurs named and described this year (only one – Crittenceratops krzyzanowskii), we expect the Marginocephalia clade, specifically the North American Ceratopsia to be increased substantially again next year. Team members at Everything Dinosaur predict that at least four new horned dinosaurs from the United States will be named and described in 2019. Diversity in the horned dinosaurs. Everything Dinosaur team members predict that there will be another four new Ceratopsia taxa from the United States described in 2019. In recent years, we have featured a number of amazing fossil finds from the Silurian-aged deposits from the secret Lagerstätte in the county of Herefordshire. These fossils represent an ancient marine biota that was covered in fine volcanic ash some 425 million years ago. Such is the exquisite nature of their taphonomy that even the finest soft tissues have been preserved. We predict that British-based scientists will utilise high-resolution computed tomography in conjunction with computer-generated three-dimensional modelling to reveal a new species of Silurian marine invertebrate. More Chinese dinosaur fossil discoveries are going to be made in 2019. We also expect fresh insights into the Cretaceous flora and fauna entombed in amber from Myanmar. However, amongst the twenty or so new species of dinosaur described in the next twelve months, we predict that one of these new-to-science specimens will be found in India. Many parts of the world (Africa and Asia) for example, are being opened up to geological and fossil exploration. Several different types of dinosaur are already known from the sub-continent and we predict that there will be a new addition to the dinosaur fauna described from India. Will a New Dinosaur Species be Discovered in India? As well as writing about what other people have been doing, we expect our blog site to update readers on how Everything Dinosaur itself is evolving and changing. Our core values of customer service and finding the very best quality prehistoric animal products are not going to change, but visitors to: Everything Dinosaur can expect to see some changes next year – all aimed at improving our service and helping our customers. The number of different types of prehistoric animal models that we offer is also going to increase, but by how many? Let’s predict another fifty new models to be made available on our website in 2019. With more and more sophisticated and sensitive devices being made available to palaeontologists to aid their research, 2019 will see further developments in the study of fossil specimens on the molecular level. There have already been some remarkable papers published on the presence of fossilised microscopic structures containing the colour pigment melanin (melanosomes) and we confidently predict that this trend will continue. We predict that further evidence will emerge next year concerning the colour of members of the Dinosauria. Sausage-shapes – potential melanosomes. Research is likely to continue into prehistoric animal colouration in 2019. Recent fossil discoveries have indicated that the Pterosauria were more diverse than previously thought towards the very end of the Cretaceous (Campanian to Maastrichtian faunal stages). Everything Dinosaur has reported on the discovery of several fossil fragments from Europe and Africa in recent years and we predict that a new species of large, very probably azhdarchid, pterosaur will be described in 2019. The fossil find could come from northern Africa or perhaps from the famous Hateg Basin deposits of Romania. 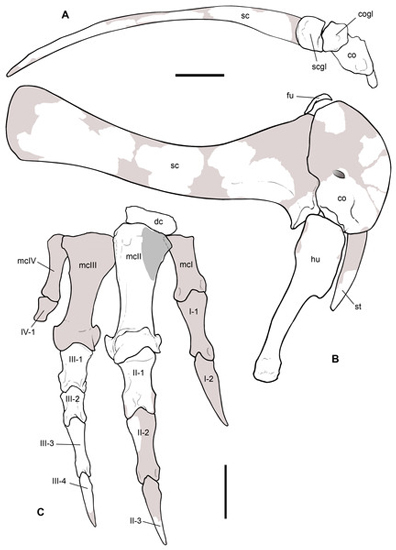 An Azhdarchid Pterosaur Wrist Bone (Hateg Island) – Will a New Species of Azhdarchid Pterosaur be Described in 2019? Azhdarchid pterosaur wrist bone. What surprises lie in wait for flying reptile researchers in 2019? We began our predictions by stating that we thought it was likely that at least four new horned dinosaur taxa from the USA will be named next year. With all these herbivores being named and described, it would not surprise us if some more, large Theropod dinosaurs were formally described from fossil material found in the United States next year as well. Let us conclude our crystal ball gazing by suggesting that two new species of Late Cretaceous tyrannosaurid will be identified from fossil finds from the southern USA (southern parts of Laramidia). Will New Members be Added to the Tyrannosauridae Family in 2019? Will new Tyrannosauridae taxa be described in 2019? This time next year, as we approach the end of 2019, we will review our predictions and see how we got on. Today, we conclude our look at our most memorable blog posts of 2018, with a review of blog posts from July through to December. Since we try to post something up every day, there are certainly a lot of articles to choose from, in our previous posting covering the first six months of the year, we certainly came up with an eclectic mix: Top Blog Posts of 2018 (Part 1), part two is very much cut from the same cloth, with a wide range of scientific subjects covered. July featured marine crocodile evolution, a dinosaur discovery from Northern China (Lingwulong shenqi) that defied logic, Utah’s latest armoured dinosaur, Spanish plesiosaurs and French Gomphotheres. However, we were “tickled pink” to be able to write about the analysis of 1.1 billion-year-old cyanobacteria that led to the extraction of pink coloured pigments from ancient marine shales. The world’s oldest biological colour turns out to be pink: In the Pink! The First Colour of Life. The oldest colours found to date. The beautiful summer weather continued into August and much of the UK faced drought conditions. However, fossil finds and prehistoric animal news stories did not dry up. Team members wrote about marine reptile discoveries in Queensland, a new nodosaurid from Mexico, Chinese alvarezsaurids, a challenge to the idea of aquatic spinosaurids, Scottish Sauropods and toothy pterosaurs from the Late Triassic. It was an article on how a team of scientists had learned to mimic the fossilisation process, compressing millions of years into just 24-hours that really got our attention. After all, having a better understanding of how fossils form (taphonomy), will help to improve fossil interpretation: Do It Yourself Taphonomy! This year, we have seen numerous scientific papers published relating to the evolution and dispersal of the Sauropodomorpha (the Sauropods and their ancestral forms). For example, researchers from the University of Texas concluded that ancestors of North American, Early Jurassic Sauropodomorphs, such as Sarahsaurus were essentially migrants. In China, a study of Yizhousaurus fossil material yielded new data on the evolution of long-necked dinosaurs. The announcement of the discovery of a monstrous Late Triassic Sauropodomorph from Argentina (Ingentia prima), demonstrated that gigantism in the Dinosauria occurred earlier than previously thought. Amongst all these amazing Sauropodiform/Sauropodomorpha articles, we even managed to publish a feature on the oldest, long-necked dinosaur described to date – Macrocollum itaquii. October like much of the year, was dominated by the Sauropods: The Ancestors of Sarahsaurus Probably Did Not Originate in North America. 2018 will be remembered as the year that featured a lot of Sauropodomorpha fossil discoveries and research. 2018 is likely to be remembered by many vertebrate palaeontologists as the year in which the evolution of the Sauropodomorpha began to make more sense. Our blog posts in November were dominated by news of new models and figures for 2019. The weblog also covered elephant-sized Triassic Dicynodonts, Oregon Ornithopods, Enantiornithine birds from Utah, Ornithischian dental batteries, a new Rebbachisaurid (Lavocatisaurus agrioensis), from Argentina and our work in schools. However, it was a feature on the enigmatic Elasmotherium, sometimes referred to as the “Siberian Unicorn” that stood out for us. A scientific paper published in November, revealed that the enormous Elasmotherium probably survived until as recently as 36,000 years ago. It was climate change that ultimately led to the demise of this beast, the paper on the relatively recent extinction of a member of the Rhinoceros family puts into focus the current plight of the remaining members of this once diverse and extensive family of hoofed mammals. All extant members of the Rhinocerotidae face a very uncertain future. The CollectA Deluxe Elasmotherium model. A replica of the recently extinct Elasmotherium sibiricum. As the year drew to a close, the breadth and scope of the topic areas we attempted to cover did not diminish. Over the course of December lost Australian dinosaur toe bones, a new, dog-sized dinosaur from down-under (Weewarrasaurus pobeni), Ichthyosaur blubber, new models and replica retirements all featured. This month, we also wrote articles about a new Russian dinosaur (Volgatitan simbirskiensis) and featured a paper that demonstrated that the first flowering plants probably evolved at least fifty million years earlier than previously thought. Two articles we published stand out for us, firstly, on December 14th we produced an article on the Ceratopsian Crittendenceratops krzyzanowskii, a new species of Centrosaurine from Arizona. In the last twenty years or so, there have been an astonishing number of new horned dinosaurs described and named. Ironically, Crittendenceratops is the first (and only), new horned dinosaur to be named in 2018: A New Horned Dinosaur Species from Late Cretaceous Arizona. A life reconstruction of the newly described Ceratopsian Crittendenceratops (2018). Secondly, our blog post from December 17th, featured the work of an international team of scientists who had identified four kinds of feather-like filaments on the fossils of Pterosaurs: Are the Feathers About to Fly in the Pterosauria? If they are correct, then this suggests that either the Pterosauria evolved feathers as a form of convergent evolution separate from the Dinosauria, or, that feathers evolved many millions of years earlier than previously thought – in a common ancestor of the Dinosauria and the Pterosauria clades. Interesting times ahead for those palaeontologists that study flying reptiles. Pterosaur material. A study published in December 2018 suggests that flying reptiles had feathers. As we approach the end of 2018, we have time to reflect on all the blog articles that we published over the last twelve months. At Everything Dinosaur, we try to publish a blog article for every day of the year, this means of course that we have thousands of articles on our weblog so, providing a review of what we have published in 2018 is quite a mammoth task. Here is a selection of articles that were added over the course of January through to June 2018. In January, we wrote articles on the discovery of a new, speedy Ornithopod from Australia (Diluvicursor pickeringi), explained how drill cores from northern Germany pushed back the evolution of butterflies and moths by some seventy million years and discussed the naming of Mansourasaurus shahinae, the first, nearly complete dinosaur skeleton from Upper Cretaceous rocks in Africa. However, arguably the most “colourful” story covered was that of Caihong juji from Middle Jurassic rocks of China, a small Theropod that may have had iridescent feathers. An illustration of the Jurassic feathered dinosaur Caihong juji. As we moved into the spring, this blog site dealt with bipedal lizard tracks from the Cretaceous, how Neanderthals used their brains, new Megaraptoran dinosaurs and celebrated publishing our 4,000th article. Perhaps, two of the most memorable articles featured new research indicating that plants may have evolved millions of years earlier than previously thought and the naming of a basal member of the Ankylosauridae from China called Jinyunpelta sinensis. When Did the First Plants Evolve? Early land plants would have resembled the flora found in this Icelandic lava field. It has certainly been a big year for the Kingdom Plantae, new evidence has emerged that flowering plants (Angiosperms), may have evolved in the Jurassic! In April and May, we featured Theropod feeding methods, clever Cretaceous lacewings and turtle evolution missing links. Wounded Lufengosaurs made an appearance along with Uruguay’s first ever Pterosaur, dinosaur dandruff, nesting behaviour and lots more flying reptiles, including an article on the largest Pterosaur mandible ever found. Two posts that stand out for us, was one written on April 10th that documented the finding of a single human finger bone that indicates that Homo sapiens migrated out of Africa earlier: Finger Bone Points at Early H. sapiens Migration. The second post concerned the discovery of a fragment of spinosaurid leg bone that provided an insight into how these Theropod dinosaurs may have adapted to an aquatic lifestyle. Furthermore, the piece of bone hinted that spinosaurids in excess of ten metres long inhabited South America. An illustration of a South American Spinosaur attacking a Pterosaur. June was the start of a record breaking summer in the UK, in between basking ourselves and applying copious amounts of sun-tan lotion we tackled, rare Japanese dinosaurs, fossil fungi, stem mammals from the Early Cretaceous, tiny frogs preserved in amber and flocks of Eumaniraptoran dinosaurs. With the premier of the latest film in the “Jurassic Park” franchise in cinemas, “Jurassic World – Fallen Kingdom”, rather than review the film, we chose to feature the work of some physicists from Imperial College London who calculated just how much energy would be required to run a real “Jurassic Park”. The energy costs involved in running a “Prehistoric Park”. Thus, ends our overview of the first six months of blog articles that we have written, tomorrow we shall look at the last six months of the year and feature the first colour to evolve along with DIY fossils and conclude a remarkable year for the Sauropodomorpha. Being a very large dinosaur covered in armour, might help you to keep safe from attack by predatory dinosaurs, but this body plan does have its downsides. For example, how do you keep cool when you have a very broad body? New research from scientists based at Ohio University and the New York Institute of Technology College of Osteopathic Medicine at Arkansas State, suggests that those complicated Ankylosauria nasal passages acted like heat-exchanges helping to prevent these dinosaurs from overheating. In essence, this study published in the academic, on-line journal PLOS One, suggests that members of the Ankylosauria clade had built-in air conditioning units in their noses. Ankylosauria nasal passages used as heat exchanges. The researchers, which included Jason Bourke (Assistant Professor at the New York Institute of Technology College of Osteopathic Medicine at Arkansas State), chose to examine the craniums of Euoplocephalus (E. tutus), a member of the Ankylosauridae family of dinosaurs along with the nodosaurid Panoplosaurus mirus. A representative of the Nodosauridae family as well as a member of the Ankylosauridae was selected as Nodosaurs tend to have much narrower muzzles than the related Ankylosaurs. In this way, the scientists were able to compare and contrast the different nasal passages associated with these two types of armoured dinosaur. Victoria next to a skull of a Euoplocephalus tutus (University of Alberta). Note the broad muzzle and the wide skull of this Late Cretaceous ankylosaurid. The research team created three-dimensional, computer generated models of two famous skull fossils, a Panoplosaurus specimen housed in the Royal Ontario Museum collection and a Euoplocephalus skull from the American Museum of Natural History (New York). A computational fluid dynamic analysis was then undertaken to map how air would have moved through the nasal passages as these dinosaurs breathed. The scientists wanted to test the heat exchange capacity of the complex passages, to see how well the Ankylosauria noses transferred heat from the body to the inhaled air. It is thought that these complex nasal passages gave members of the Ankylosauria clade, an exceptional sense of smell. This may have been their primary function, however, noses are also heat exchangers, ensuring that air is warmed and humidified before it reaches the delicate lungs. To accomplish this effective air conditioning, birds and mammals, including humans, rely on thin curls of bone and cartilage within their nasal cavities called turbinates, which increase the surface area, allowing for air to come into contact with more of the nasal walls. Ankylosaurs and nodosaurids lacked turbinates, to compensate for this they evolved exceptionally long and twisty nasal passages. When the researchers compared their findings to data from living animals, such as the nasal passages of an avian dinosaur (pigeon), they discovered that the noses of armoured dinosaurs were just as efficient at warming and cooling respired air. The length of the winding and twisting nasal passages in the two armoured dinosaurs studied were also measured. In the narrow-snouted, nodosaurid Panoplosaurus, the nasal passages were a bit longer than the skull itself and in Euoplocephalus they were almost twice as long as the skull, which is why they are coiled up in the snout. To see if nasal passage length was the reason for this efficiency in heat exchange, the researchers created alternative models with shorter, simpler nasal passages that ran directly from the nostril to the throat, as in most other animals. The results clearly showed that nose length and the length of the nasal passages were indeed key to their air-conditioning ability. The blood vessels in the skull leading up to and surrounding the brain were mapped. The scientists wanted to explore whether the internal plumbing of the snout helped to cool the brains of armoured dinosaurs. The team found a rich blood supply running adjacent to the convoluted nasal passages. Vascular pathways associated with the brain of Euoplocephalus tutus. Red highlighted veins indicate main channels of heat transfer. The large, broad bodies of Panoplosaurus and Euoplocephalus were really good at retaining heat, which might have some advantages, especially when you need to stay warm, but this does cause problems when large Tetrapods need to keep their cool. This heat-shedding problem would have put them at risk of overheating even on cloudy days. In the absence of some protective mechanism, the delicate neural tissue of the brain could be damaged by the hot blood from the body core. In simple terms, the small brains of armoured dinosaurs might have been cooked inside the skull. The complicated nasal airways of these dinosaurs were acting as radiators to cool down the brain with a constant flow of cooled venous blood. This natural engineering feat also may have allowed some members of the Dinosauria to evolve into huge animals. Christmas is a time for family get togethers and spending time with relatives. Today, we feature the astonishing story of the remarkable and nearly complete fossilised skeleton of an Australopithecine nicknamed “little foot” a member of the Hominidae family and as such, a long, distant relative of us all. The Sterkfontein Caves in South Africa are located around twenty-five miles north-west of Johannesburg in Gauteng Province (South Africa). Numerous fossils of hominids are known from the Caves and the surrounding area, which is called the Cradle of Humankind and Everything Dinosaur has reported on several recent and highly significant Australopithecine fossil finds, however, at an estimated 3.67 million years of age, “little foot” is the oldest Australopithecine specimen ever found in southern Africa. The fossilised remains of the Australopithecus nicknamed “little foot” found in the Sterkfontein Caves. The skull can be seen in the bottom right corner of the photograph. Lead researcher Professor Ron Clarke and his team have published the first, formal scientific description of the fossil material in the “Journal of Human Evolution”. Such is the completeness of the skeleton, that anthropalaeontologists confidently predict that many more papers will be written, as this is the only known, virtually complete fossil skeleton of an Australopithecus discovered to date. It has taken fourteen years of painstaking work to excavate the fossils and six years to clean and prepare them for detailed study. In 1994 and 1997, Professor Clarke identified twelve foot and lower leg bones of one Australopithecus individual misidentified as animal fossils in boxes stored at Sterkfontein and at the University of Witwatersrand (Johannesburg). Clarke and his assistants, Nkwane Molefe and Stephen Motsumi, then looked for and located the very spot where the bones had been blasted out by lime miners, probably sometime in the 1920’s deep inside the Sterkfontein Caves. It was a real case of detective work, as Nkwane and Stephen worked in the caves to try to identify the very spot where the fossils that had been stored in the boxes, actually came from. After one and a half of days of carefully searching the caves, they found that the pieces matched with two broken-through shin bones in a concrete-like cave infill and started the excavation process, first with hammer and chisel to remove the overburden, before turning to the painstaking process of locating and exposing the bones with an airscribe. 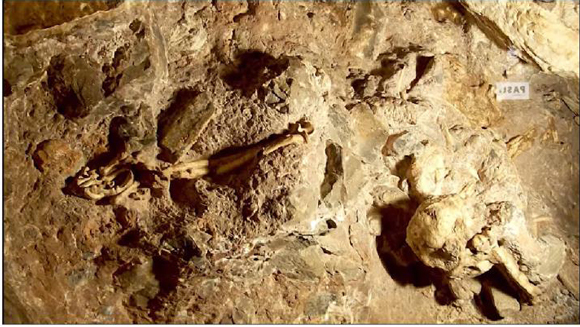 Researchers demonstrate how the rest of the skeleton was found by matching fragments of limb and ankle bones to fossil material exposed in the cave. The taphonomy of “little foot” is unusual. The female (identified by the shape of the pelvis), fell into a cave and the body became mummified in the exceptionally dry conditions. The absence of predators allowed the body to remain undisturbed but at some time in the past there was a slight displacement of some skeletal parts through slippage on the rock-strewn talus slope in the cave, crushing and breaking of some bones through rockfall and pressure, calcification after a change to wet conditions, and then slight downward collapse of part of the cave infill. This partial collapse left voids that were later filled with stalagmitic flowstone that encased breaks through the femurs. When the first attempts to date the fossils was made, an analysis of the stalagmite flowstone encasing the fossil was made. However, the flowstones were later infills in voids created by the collapse that had broken and displaced parts of the skeleton. The data gave a more recent date for the fossil, “little foot” was actually much older, having lived during the Zanclean stage of the Pliocene Epoch. Professor Ron Clarke showing how an airscribe was used to remove the surrounding matrix. Study of the anatomical features of “little foot” suggests that the skeleton is most similar to the Australopithecine known as A. prometheus, which was proposed as a species in 1948 by the famous anthropologist Raymond Dart. The phylogeny of the Australopithecines and related genera is controversial. It is hoped that the virtually complete skeleton, so painstakingly excavated, will shed new light on taxonomic relationships, helping to fill in a number of evolutionary gaps. Professor Ron Clarke with the skull and left humerus of “little foot”. Everything Dinosaur acknowledges the assistance of a press release from the University of Witwatersrand and supporting materials in the compilation of this article. The great day has finally arrived! Christmas has come and Everything Dinosaur staff, are roaring and swishing their tails with excitement. We have a busy couple of days ahead of us, what with the start of our annual stock take, but there is still time to wish all our blog readers, customers, Facebook fans, Twitter and Instagram followers along with everyone else for that matter, the compliments of the season. Happy Christmas from Everything Dinosaur. Compliments of the season to you! November and December have been frantic, with lots and lots of orders to pack and despatch. We can’t believe that it has been a whole year since we were wishing everybody a Happy Christmas 2017! Doesn’t time fly when you are having fun. We have some amazing plans in place for 2019, we are going to be busier than ever. However, for the time being we are going to tuck into a representative of the Theropoda – a turkey. Team members at Everything Dinosaur recently started the company’s annual stocktake. Whilst tidying up, a handful of rare dinosaur models were discovered. Some Safari Ltd Carnegie Collection Acrocanthosaurus dinosaur models, complete with original packaging and labels. This dinosaur model went out of production many years ago and is highly-prized by collectors. The rare and long ago retired Safari Ltd Carnegie Collection Acrocanthosaurus dinosaur model. The Carnegie Collection range of prehistoric animal models was retired in early 2015. The last of the dinosaur models to be added to this range was a Velociraptor. The Carnegie Collection range is regarded as a set of “classic” figures, they may not be anatomically accurate, not by the standards set these days, but the hand-painted models are highly sought after by discerning collectors. To find some Carnegie Collection Acrocanthosaurus models is a real coup. The very rare Carnegie Collection Acrocanthosaurus dinosaur model. The Carnegie Collection Acrocanthosaurus (model number 403901), was first produced back in 2001, like the rest of this popular range, it was thought to be long gone. However, a handful have been discovered, all in pristine condition in Everything Dinosaur’s warehouse. We wonder what other little treasures our annual stocktake might turn up! There has been quite a lot of media coverage this week, following the publication of a scientific paper that described the interaction between a shark from the Western Interior Seaway (Cretoxyrhina mantelli) and a pterosaur (Pteranodon). A single tooth from the shark, was discovered wedged against the fourth cervical vertebra (fourth bone in the neck), of the flying reptile. The association of the tooth and its proximity to the vertebra suggests that the preservation of bone and tooth together was more than mere coincidence. The specimen is evidence of a Cretoxyrhina shark biting a Pteranodon. Evidence of a shark bite on the neck of a pterosaur. The red arrow indicates the location of the shark tooth and its association with cervical vertebra IV. Scale bar = 5 cm approximately. The Pteranodon specimen is housed in a glass case at the Los Angeles Museum of Natural History, so the researchers, David Hone (University of London), Mark Witton (Portsmouth University) and Michael Habib (University of Southern California), had difficulty in obtaining direct access to the fossils. However, undeterred they made measurements of the embedded fossil tooth and it is estimated to be 24 mm high (root plus crown) and its morphology suggests that it came from a well-known lamniform shark from the Western Interior Seaway – C. mantelli. Based on the tooth dimensions, the shark is estimated to have been around 2.5 metres long, big, but not as large as some Cretoxyrhina mantelli specimens, this species of Late Cretaceous shark is believed to have reached lengths of around seven metres, making it larger than the extant Great White (C. carcharias). Teeth associated with lamniform sharks are particularly common in marine deposits associated with the Western Interior Seaway. The morphology of the tooth suggests that this tooth came from Cretoxyrhina mantelli and this fossil specimen (LACM 50926), is the first documented occurrence of this large shark interacting with any type of flying reptile. Tracing of Cretoxyrhina mantelli anterior teeth. The root of each tooth is shaded pale gray, whilst the crown is dark gray. Tooth (a) is position 3 in the jaw, (b) represents a tooth from position 4, whilst (c) is a representation of the fossil tooth found in close association with the Pteranodon cervical vertebra. It is not possible to state categorically, whether the fossil specimen (LACM 50926), is evidence of predation or whether the shark took a bite out of a Pteranodon carcase. Several examples of Cretoxyrhina spp. feeding traces are known on the fossilised remains of other vertebrates from the Western Interior Seaway. In addition, there is evidence to suggest other types of fish, including sharks, consumed Pteranodon. This is the first example of an interaction between Cretoxyrhina and “toothless wing”. Shark tooth embedded in a Pteranodon neck bone. Two views (a and b) of the tooth in association with the pterosaur vertebra and accompanying line drawings. One of the co-authors of the paper, Mark Witton, is a highly respected palaeoartist, as well as an authority on the Pterosauria. He has produced a stunning illustration of a Cretoxyrhina shark leaping out of the water as it bites the neck of a Pteranodon. A Cretoxyrhina shark leaps from the water as it attacks a Pteranodon. Pteranodon is widely believed to have foraged for small fish and other aquatic prey by alighting on the water and dip-feeding. Once on the surface of the sea, it would have been within the reach of predatory sharks, although whether the breaching Cretoxyrhina portrayed by Mark Witton accurately depicts an attack by the shark on a pterosaur is open to speculation. However, the image is visually stunning and as marine seabirds today are actively predated by sharks, an example being Tiger sharks attacking fledgling albatross chicks, such a dramatic scene could have taken place on the waters of the Western Interior Seaway. However, the tooth in association with the cervical vertebra could have resulted from the scavenging of a pterosaur carcase. The Pteranodon fossil in the display case is not all that it seems. Like many museum specimens, it is a composite, it is made up of bones from several animals to help make the skeleton more complete. Furthermore, part of the fossil display is genuine, but numerous elements have been reconstructed to replace absent parts. The authors note that the preservation quality and size of the vertebrae correspond well to the other elements (including the forelimb bones) and this implies that LACM 50926 may represent much of a skeleton. However, the absence of both anteriormost and posterior cervical vertebrae means no anatomical continuity links the 50926 vertebrae with the rest of the material and subsequently, their association to the rest of the skeleton cannot be stated confidently. With all this said, LACM 50926 is the first palaeoecological link between a feeding Cretoxyrhina mantelli and a Pteranodon. Such evidence of interactions like this are very rare in the fossil record. Pteranodon seems to have been a relatively common flying reptile, it makes up some 97% of the Niobrara Formation pterosaur fossil finds. Sharks feeding on large pterosaurs such as Pteranodon may have been a more frequent occurrence, but the hollow bones of these flying reptiles may have broken quite easily when subjected to the biteforce of a shark and so the likelihood of any fossil evidence being preserved would be diminished. Chances are the evidence of such interactions just got consumed. The scientific paper: “Evidence for the Cretaceous Shark Cretoxyrhina mantelli feeding on the pterosaur Pteranodon from the Niobrara Formation” by David W. E. Hone, Mark P. Witton and Michael B. Habib and published in the open access journal PeerJ. Scientists from Natural History Museum of Milan and the Geological Museum of Bologna (Museu di Storia Naturale di Milano and the Museo Geologico), have published a scientific paper on a new predatory dinosaur from the Lombardy region of northern Italy. This new species was a giant, weighing around a tonne and measuring approximately 7.5 metres in length. It lived some 25 million years before other known big predatory dinosaurs evolved and examination of the fossilised bones suggest that this dinosaur was still growing when it died. The dinosaur has been named Saltriovenator zanellai and it is the largest Theropod described to date from the Early Jurassic (Sinemurian faunal stage). A life reconstruction of Saltriovenator from the Early Jurassic of Italy. Saltriovenator was discovered by chance in the summer of 1996 by amateur fossil collector Angelo Zanella, whilst exploring fossil rich limestone layers associated with a marble quarry near the town of Saltrio (Varese Province, Lombardy). The strata containing the fossilised remains represent marine deposits and explosives used in the quarrying process had broken up the fossil bearing layer into hundreds of pieces. In total, 132 fossil pieces were excavated from the site, the remains of a single animal. The bones show feeding traces from fish and borings from marine invertebrates. The palaeontologists writing in the on-line academic journal “PeerJ” suggest that the carcase was washed out sea and stayed on the seabed for some time, permitting the scavenging to take place. Selected fossils of Saltriovenator and a skeletal reconstruction. Sections coloured red indicate fossil material. The picture above shows key fossils that helped to classify Saltriovenator as a member of the Ceratosauria clade, it is the oldest Ceratosaur described to date. A, B, C = views of the right humerus. E = right scapular glenoid and coracoid. G = single tooth from the anterior portion of the lower jaw. I = partial left humerus, the circular depressions represent borings made by marine invertebrates feeding on the carcase. J, L, N = views of the right second metacarpal (finger bone). K, M, O, = views of the right second digit. P-T = views of the right third digit. U = distal tarsal IV. V, X = third right metatarsal views. W, Y = second right metatarsal views. Z = reconstructed skeleton of Saltriovenator with identified fossil elements shaded red. Scale bars: 10 cm in (A)–(E), (I), and (U)–(Y); two cm in (F), and (J)–(T); one cm in (G). Saltriovenator skeletal reconstruction. Colour key – right bones in red; counterlateral copies of the left bones in light red; bones from the medial side of the lower jaw in orange. Note scale bar equals one metre. Saltriovenator is the first dinosaur to be described from fossils found in the Italian Alps. It is the first dinosaur from the Jurassic Period to have been found in Italy and the country’s second Theropod, the first being Scipionyx samniticus which lived during the Early Cretaceous and at just over two metres in length, was considerably smaller than S. zanellai. A study of growth rings found in a cross-sectional analysis of the fossil bones indicates that the dinosaur was around twenty-four years of age when it died. It was still growing, albeit slowly, so the maximum size of this predator is not known, although at an estimated 7.5 metres long, it was considerably bigger than any other Theropod from the Early Jurassic described to date. Saltriovenator exhibits a mosaic of features seen in four-fingered Theropods and basal Tetanuran dinosaurs. The fossilised finger bones indicate that this dinosaur had a fully functioning four-fingered hand, well-adapted for grasping and coping with struggling prey. Later Ceratosaurs had only three fingers on each hand. Study of the finger bones will help scientists to understand better the evolutionary relationships between the four-fingered Dilophosaurs, Ceratosaurs and later types of Theropod such as the Allosaurs with their atrophied hands. Saltriovenator pectoral girdle and forelimb with a line drawing of the right hand showing four fingers. Preserved elements in white, reconstructed bone in light grey, exposed inner bone in grey, hidden bone in dotted lines. Scale bar equals 10 cm in (A) and (B), five cm in (C).